Really, I should be sewing. But I went all the way to the museum only to find out I wasn't needed, so I need to do something more relaxing for a bit (also I'm not really sure how I'm going to attach the skirt to the jacket). I was looking at the Augusta Auctions site earlier, and saw some interesting listings of old sales. This is the first one that made me go, "huh?" First, what they describe as " pendant self fabric bands to cross-over and pin under arms" - it looks cool, but I don't think I've ever seen anything like that. 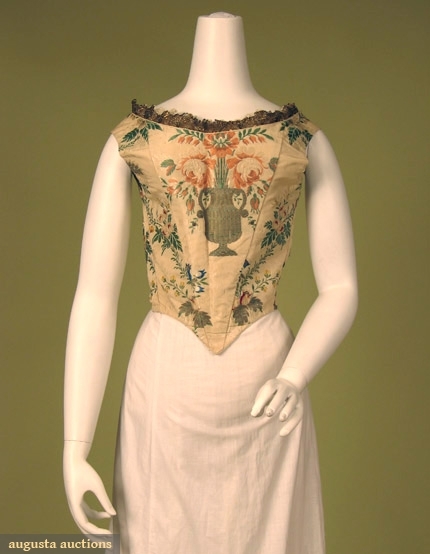 Based on the close-up picture of the lacing in the front, I think the bodice laced up the front, then a stomacher was pinned over the lacings, and then these robings were pinned down the sides of the stomacher. And then when you look at the picture of the back ... 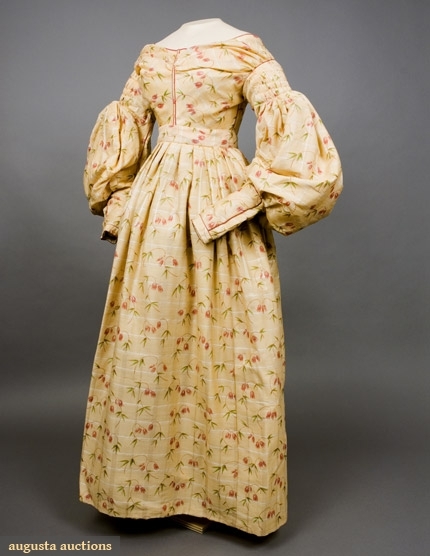 I don't think I've seen a française with pleats that small. It's interesting. 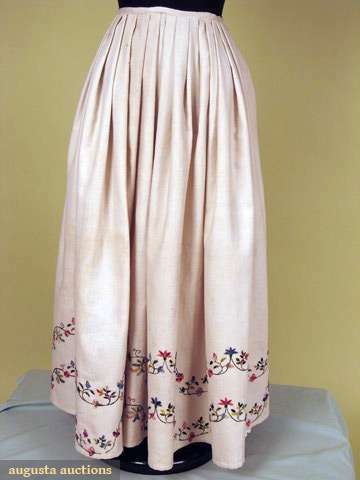 Although they say there are some bodice alterations, so maybe this is a pleated anglaise with some of the pleats unstitched. 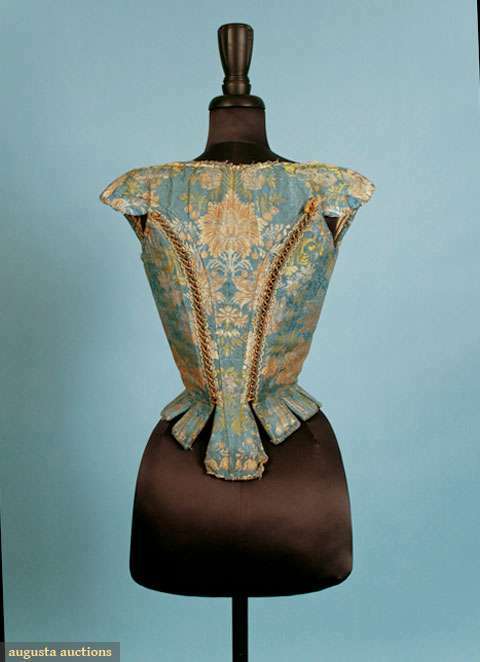 They call this one an 18th century bodice, but it's actually a great example of 18th century fabric reused to make 1840s/50s evening dress. 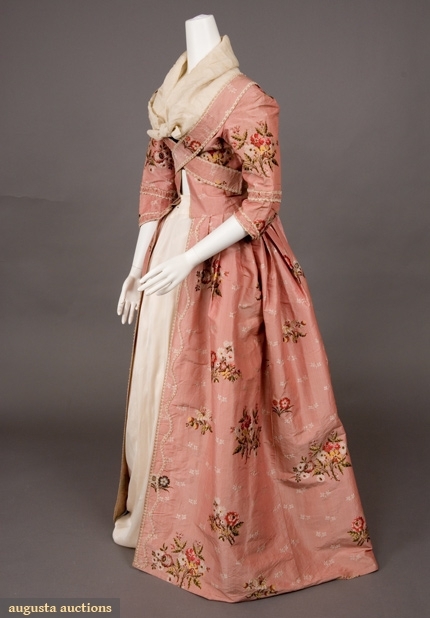 I could definitely see trying to make a petticoat like this one. You know? Just enough embroidery to make the statement that I like embroidery and do it by hand, without being so much that I never finish the project. 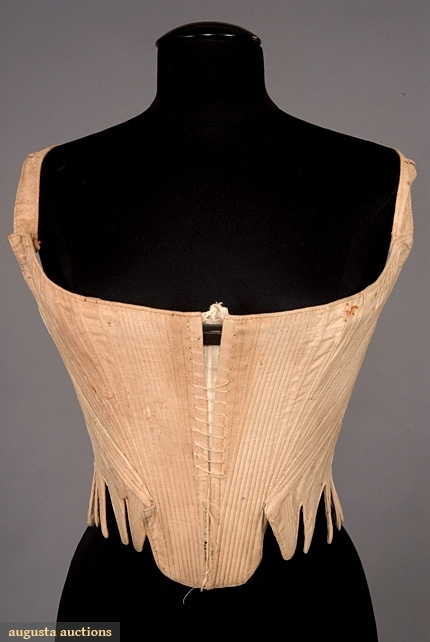 Pretty impressive stomacher-less stomacher-front stays. 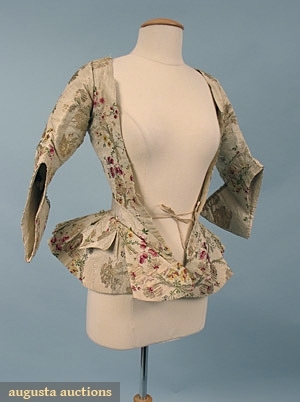 I'm kind of amazed with the side-back decorative lacing (or is it? I think there's a theory that side-back lacing is for pregnancy). Really beautiful. I wish I weren't working on anything now and could make new stays, because these are very inspiring. 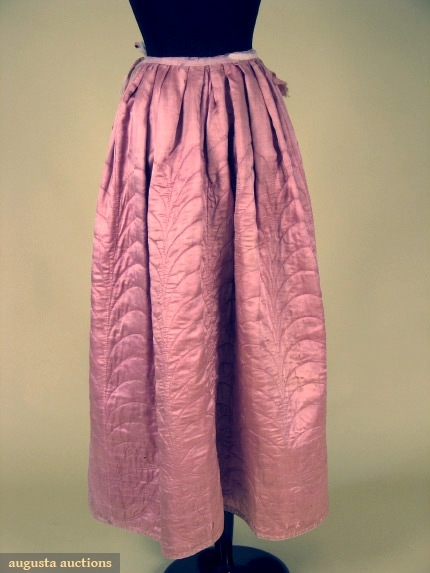 Quilted petticoat! 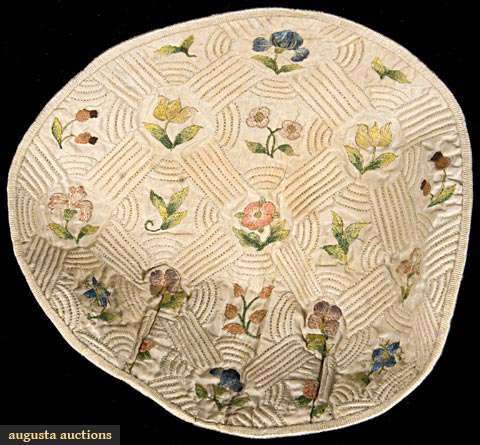 I love a quilted petticoat. Mom and I went to Walmart yesterday to get something for her to make into a petticoat, and I found a diamond-quilted blue cotton that I nerdily forced her to go with. I love quilted petticoats so much. A "cap back". I only have a little idea how that works, but I think it's adorable. LOOK AT THAT. Just look at it. Isn't it wonderful? Don't you just want to jump into the screen and wear it?